Business cards, or name cards originated in China in the 15th century, were used in Europe soon after, and then became mainstream world wide. Even in todays digital age business cards are used almost everywhere due to their communication effectiveness, and satisfying tangible qualities. Business cards communicate through their printed words & images, as well as through their tactile properties - weight, texture, stiffness, and any special standout treatments. Some commercial printers use various 'tricks' to try and make their products appear extra attractive or low cost. These tricks include adding their brand name to the cards, using low grade, low weight, or incorrect grain stock card, retaining ownership of any artwork, charging extra for a protective box, using colour photocopiers instead of colour managed digital printers, etc. 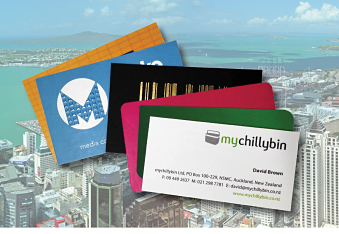 Expect professional business card printing, without corporate pricing. Choice of three stocks. The default and normally used stock is uncoated art stock with a very light texture, or if requested then smooth surface coated matt or coated gloss. Digital colour printing on both faces with full colour calibration to your stock before printing. Printed from the pdf print ready file you supply. Copy Colour Printing specialises in being a printing company, and prints for many designers. However, if you are needing edits to existing card artwork, or a simple card layout services please ask. These services are charged at $85 per hour. Lead time on receipt of a print ready file and card order, is typically two work days for production. Urgent production with reduced lead time is often available at $30 extra. Copy Colour Printing normally supplies business customers - so GST is additional to all prices on this page. To add either matt or gloss regular laminate to a batch of up to 2,000 cards add $105, and allow 2 extra days. To add 'velvet touch' matt laminate to both faces giving the cards a special warm high friction feel, add $148 per order of 500 cards, or $198 for 1,000 cards, and allow 2 extra days. Switch to a 300gsm linen fine texture stock, for an extra $68 for 500 cards, or $128 for 1,000 cards - plus gst. Not suitable for use with laminates. Switch to a 300gsm standard white uncoated stock with zero carbon emission. Specially developed to deliver great colour. Rounded 4 corners (on 90 x 55mm card size only), for an extra $108 per order of 500 cards, or $138 for 1,000 cards - plus gst. Allow 2 extra days. Embossed (or debossed), specially quoted to specific design, for roughly around $100 one time cost to make the embossing plate, and $100 to run the process on the batch of cards - plus gst. Allow 5 extra days for the first run. Cconsider the effect on the reverse of the card, or ask about blind embossing. Cut to shape, or cut outs, individually quoted to specific design, for roughly around $150 one time cost for the die, and $125 to run the cut process on the batch of cards - both plus gst. Allow 5 extra days for the first run. Want something not covered above, faster delivery of your cards, or have queries? Please email David at fast@copycolour.co.nz or call on 09 449 2637.